Police investigators and soldiers attend the scene after two bombs exploded outside a Roman Catholic cathedral in Jolo, the capital of Sulu province in southern Philippines, Jan. 27, 2019. Five suspected Abu Sayyaf militants accused of involvement in the deadly bombing of a Roman Catholic cathedral in the southern Philippines have surrendered to authorities, the national police chief said Monday. Police Director-General Oscar Albayalde said the five would be charged with murder and attempted murder for their role in the Jan. 27 attack at Our Lady of Mount Carmel Cathedral in Sulu province's Jolo town, which killed 23 people and wounded about 100 others. 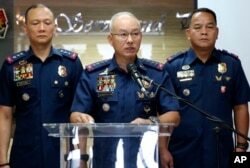 Oscar Albayalde, chief of the Philippine National Police, speaks at a news conference at Camp Crame, in suburban Quezon city, northeast of Manila, Philippines, Feb. 4, 2019. "It's the very same reason why they pledged allegiance to ISIS. They are seeking funding and they are bombing, kidnapping and murdering targets to get funds from the ISIS,'' Albayalde said at a news conference in Manila. 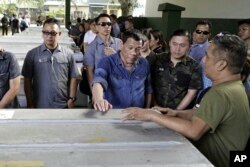 Philippine President Rodrigo Duterte, center, touches one the caskets of some of the victims of the bombings, Jan. 26, 2018, of a Roman Catholic Cathedral on Jolo, Sulu province in southern Philippines, during his visit Monday. While the local militant leader, Pae, has denied involvement in the bombing, the national police's chief investigator, Chief Superintendent Amador Corpus, said his surrendered companions have pointed to him as one of their accomplices and said he purchased parts for the bombs. A military officer with experience monitoring militants, however, raised doubts about some of the police accounts, including the discovery of a bomb and bomb parts in Pae's house in Patikul town, near Jolo. The officer wondered why Pae would leave such incriminating evidence in his house then surrender to police but deny any involvement in the attack.